1. button () is pressed? 10. Codey positioned as ()? 20. the color detected is ()? 21. () color value detected? If the specified button of Codey is pressed, the report condition is met. 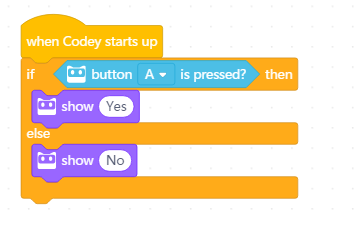 There are three buttons: Button A, Button B, and Button C.
When Codey starts up, if Button A is pressed, Codey&apos;s screen will display "Yes". If Button A is not pressed, Codey&apos;s screen will display "No". If Codey is connected to Rocky, the report condition is met. 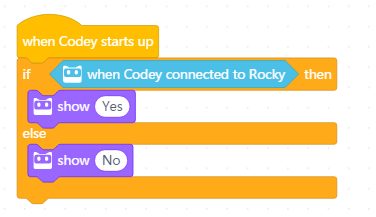 When Codey starts up, if Codey is connected to Rocky, Codey&apos;s screen will display "Yes". If not, Codey&apos;s screen will display "No". Report the position of gear potentiometer. The range of the value is 0 ~ 100, rounded to nearest integer. When Codey starts up, the gear potentiometer value will be displayed on Codey&apos;s screen. Report the loudness detected by Codey&apos;s sound sensor. The range of the value is 0 ~ 100, rounded to nearest tenth. When Codey starts up, the loudness value will be displayed on Codey&apos;s screen. Report the ambient light intensity detected by Codey&apos;s light sensor. The range of the value is 0 ~ 100, rounded to nearest tenth. When Codey starts up, the ambient light intensity value will be displayed on Codey&apos;s screen. Report Codey&apos;s battery level (0 ~ 100, rounded to nearest ten). When Codey starts up, the battery level will be displayed on Codey&apos;s screen. If Codey is being shaken, the report condition is met. 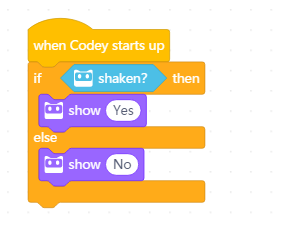 When Codey starts up, if being shaken, Codey&apos;s screen will display "Yes". If not, Codey&apos;s screen will display "No". Report the strength by which Codey is being shaken. The range of the shaking strength is 0 ~ 100, rounded to the nearest integer. When Codey is being shaken, Codey&apos;s screen will display the shaking strength. If Codey is tilted towards specified direction, the report condition is met. There are four directions: "tilted to the left", "tilted to the right", "ears up", and "ears down". The threshold value is 15 degrees. 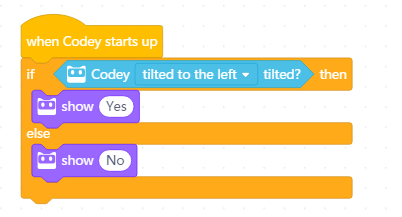 When Codey starts up, if tilted to the left, Codey&apos;s screen will display "Yes". If not, Codey&apos;s screen will display "No". If Codey is positioned as the specified position, the report condition is met. There are three positions: "face up", "face down", and "stand on desk". 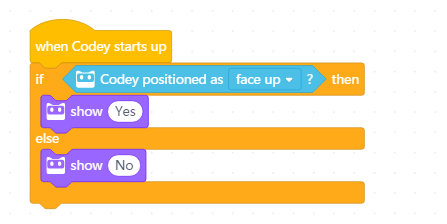 When Codey starts up, if Codey is positioned face-up, Codey&apos;s screen will display "Yes". If not, Codey&apos;s screen will display "No". Roll: -90° ~ 90°, rounded to the nearest integer; positive number means right-tilted; invalid value will be set to zero. When Codey starts up, the screen will display Codey&apos;s roll angle. Roll: -180° ~ 180°, rounded to the nearest integer; positive number means ears-up; invalid value will be set to zero. When Codey starts up, the screen will display Codey&apos;s pitch angle. Report Codey&apos;s rotation angle around the x axis. When Codey starts up, the screen will display Codey&apos;s rotation angle around the x axis. Report Codey&apos;s rotation angle around the y axis. When Codey starts up, the screen will display Codey&apos;s rotation angle around the y axis. Report Codey&apos;s rotation angle around the z axis. When Codey starts up, the screen will display Codey&apos;s rotation angle around the z axis. Reset Codey&apos;s rotation angle around specified axis/axes. There are four options: x-axis, y-axis, z-axis, and all axes. When Codey starts up, reset rotation angles around all axes. Report Codey&apos;s timer value (second, rounded to nearest tenth). When Codey starts up, Codey&apos;s screen will display timer value. Press Button A to reset Codey&apos;s timer. If Rocky&apos;s color infrared sensor detects obstacles ahead, the report condition is met. When Codey starts up, Codey Rocky will keep moving forward at 50% power. 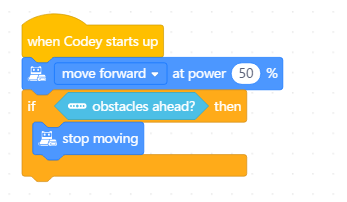 If Rocky detects obstacles ahead, Codey Rocky will stop moving. If the color detected is the specified color, the report condition is met. There are eight colors: red, green, blue, yellow, cyan, purple, black, and white. When Codey starts up, if the color detected by Rocky&apos;s color sensor is red, Rocky&apos;s LED will light up red. Report the specified color value of the obstacle detected by Rocky&apos;s color sensor. Colors include red, green, and blue. When Codey starts up, if Rocky detects color red, the value of red will be displayed on Codey&apos;s screen. Report the value of ambient light intensity detected by Rocky&apos;s color sensor. Light intensity: 0 ~ 100, rounded to nearest tenth; value exceeding 100 will be displayed as the maximum 100. When Codey starts up, Codey&apos;s screen will display the value of amibent light intensity. Report the value of reflected light intensity detected by Rocky&apos;s color sensor. When Codey starts up, Codey&apos;s screen will display the value of reflected light intensity. 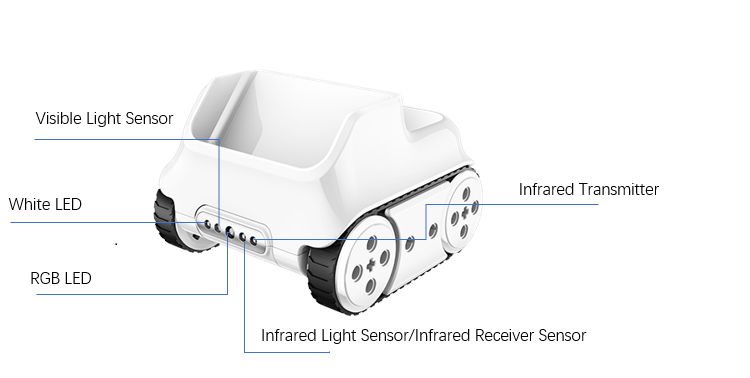 Report the value of reflected infrared light intensity detected by Rocky&apos;s color sensor. When Codey starts up, Codey&apos;s screen will display the value of reflected infrared light intensity. Report the grey-scale value detected by Rocky&apos;s color sensor. When Codey starts up, Codey&apos;s screen will display the grey-scale value.